… Pew Research Center surveys […] may help to rule out some misconceptions about the unaffiliated. For example, the surveys show that religious affiliation is declining among Americans who do not have college degrees, as well as among college graduates, which suggests that the trend is not solely a result of attitudes toward religion on college campuses. Nor, as the new Pew Research Center/Religion & Ethics NewsWeekly survey shows, are the unaffiliated composed largely of religious “seekers” who are looking for a spiritual home and have not found it yet. 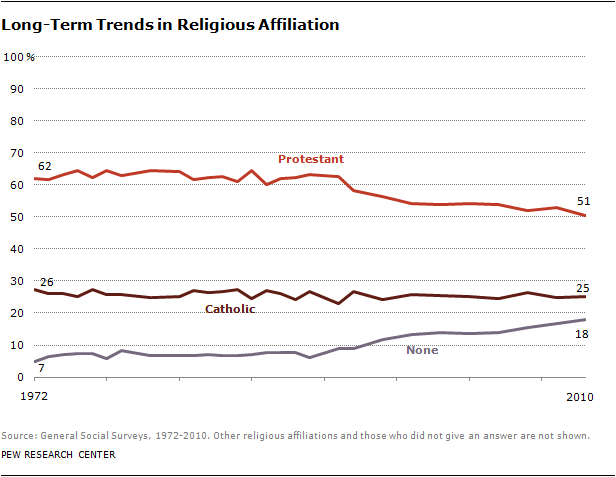 […]The decline is concentrated among white Protestants, both evangelical and mainline. It is well known, from anecdotal and statistical evidence, that Protestant denominations have faced challenged over the last few years, and have seen declines in affiliation and attendance. This has naturally led to a great deal of hand-wringing, but particularly outspoken have been the voice of conservative voices who claim that the decline has primarily touched mainline denominations (the suggestion being that policies of inclusion are at fault; e.g., acceptance of women or gay bishops), while Evangelical groups remain strong. Another long popular conservative explanation blames US higher education for a secularizing influence; according to this explanation, American colleges are hotbeds of atheism. Yet another theory blames “New Age” spirituality for the declines. So, if New Age-ism, secular education, and Mainline religion cannot be held accountable for the decline in religion, what is at fault? The Pew report suggests that this is partly a generational change, with younger Americans much less likely to have religious affiliations. 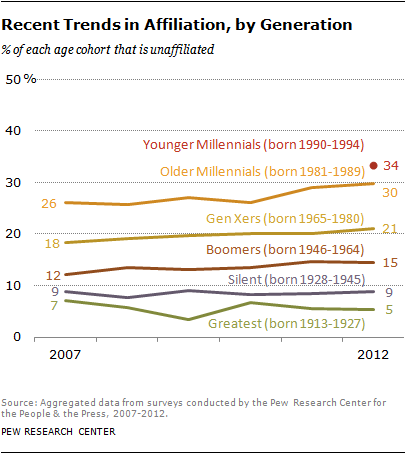 But that is only part of the story – notice that growth in unaffiliated population has taken place in the “Older Millennial” and “Gen Xers” demographics. It is all too easy to make claims that issues ranging from “gay marriage” to “equality for women” are responsible for declines in religious affiliation. But contrary to the knee-jerk responses, the statistics tell another story – declines have hit not only Mainline churches, but Evangelical churches. The survey is fascinating, and I recommend reading it.